If, like me, you’re over 40 and work in IT, you’ll probably remember a time when everyone used Windows, and a small but growing proportion of people were wasting their lives compiling Linux in their spare time. Answers to this question varied. Some liked to tinker, some wanted an OS to be ‘free’, some wanted more control over their software, some wanted a faster system, but all had some niche reason to justify the effort. As I stayed up for another late night trying to get some new Kubernetes add-on to work as documented, it struck me that I’m in a similar place to those days. Until a couple of years ago, Kubernetes itself was a messy horror-show for the uninitiated, with regularly-changing APIs, poor documentation if you tried to build yourself, and all the characteristics you might expect of an immature large-scale software project. That said, Kubernetes’ governance was and is far and away ahead of most open source software projects, but the feeling then was similar to compiling Linux at the turn of the century, or dealing with your laptop crashing 50% of the time you unplugged a USB cable (yes, kids, this used to happen). It’s not like confusion and rate of change has come down to a low level. Even those motivated to keep up struggle with the rate of change in the ecosystem, and new well-funded technologies pop up every few months that are hard to explain to others. Like Windows, AWS is a product. It’s not flexible, its behaviour is reliable. The APIs are well defined, the KPIs are good enough to be useful for most ‘real’ workloads. There are limits on all sorts of resources that help define what you can and can’t achieve. Most people want this, like most people want a car that runs and doesn’t need to be fixed often. Some people like to maintain cars. Some companies retain mechanics to maintain a fleet of cars, because it’s cheaper at scale. In the same way, some orgs get to the point where they could see benefits from building their own data centres again. Think Facebook, or for a full switcher, Dropbox. (We’ll get back to this). Like Microsoft, (and now Google) AWS embraces and extends, throwing more and more products out there as soon as they become perceived as profitable. Which brings us to AWS’s relationship with Kubernetes. It’s no secret that AWS doesn’t see the point of it. They already have ECS, which is an ugly hulking brute of a product that makes perfect sense if you are heavily bought into AWS in the first place. But there’s EKS, I hear you say. Yes, there is. I haven’t looked at it lately, but it took a long time to come, and when it did come it was not exactly feature rich. It felt like one cloud framework (AWS) had mated with another (K8s) and a difficult adolescent dropped out. Complaints continue of deployment ‘taking too long’, for example. Like Microsoft and Linux, AWS ignored Kubernetes for as long as it could, and like Microsoft, AWS has been forced to ’embrace and extend’ its rival to protect its market share. I’ve been in meetings with AWS folk who express mystification at why we’d want to use EKS when ECS is available. Which brings us to one of the big reasons AWS was able to deliver EKS, thereby ’embracing’ Kubernetes: IAM. EKS (like all AWS services) is heavily integrated with AWS IAM. As most people know, IAM is the true source of AWS lock-in (and Lambda is the lock-in technology par excellence. You can’t move a server if there are none you can see). Shifting your identity management is pretty much the last thing any organisation wants to do. Asking your CTO to argue for a fundamental change to a core security system with less than zero benefit to the business in the near term and lots of risk is not a career-enhancing move. On the other hand, similar arguments were put forward for why Linux would never threaten Windows, and while that’s true on the desktop, the advent of the phone and the Mac has reduced Windows to a secondary player in the consumer computing market. Just look at their failure to force their browsers onto people in the last 10 years. So it only takes a few unexpected turns in the market for something else to gain momentum and knife the king of the hill. Microsoft know this, and AWS know this. It’s why Microsoft and AWS kept adding new products and features to their offering, and it’s why EKS had to come. Microsoft eventually turned their oil tanker towards the cloud, going big on open source, and Linux and Docker, and all the things that would drag IT to their services. Oh, and you can use the same AD as your corporate network, and shift your Microsoft Windows licenses to the cloud. And the first one’s free. Microsoft don’t care about the OS anymore. Nobody does, not even RedHat, a business built around supporting a rival OS to Windows. The OS is dead, a commodity providing less and less surplus value. Will Kubernetes force AWS to move their oil tanker towards Kubernetes? Can we expect to see them embrace Istio and Knative and whichever frameworks come after fully into their offering? (I don’t count how–to guides in their blogs). I don’t know. But here’s some more reasons why it might. Like Microsoft in the heyday of Windows OS, AWS has only one competitor: the private data centre. And like Microsoft’s competitor then (Linux), adoption of that competitor is painful, expensive and risky to adopt. But what is the OS of that data centre? Before Kubernetes the answer would have been OpenStack. OpenStack is widely regarded as a failure, but in my experience it’s alive (if not kicking) in larger organisations. I’m not an OpenStack expert, but as far as I can tell, it couldn’t cover all the ground required to become a stable product across all the infra it needed to run on and be a commodity product. Again, this is something Microsoft ruled at back in the day: you could run it on ‘any’ PC and ‘any’ hardware and it would ‘just work’. Apple fought this by limiting and controlling the hardware (and making a tidy profit in the process). Linux had such community support that it eventually covered the ground it needed to to be useful enough for its use case. OpenStack hasn’t got there, and tried to do too much, but it’s embedded enough that it has become the default base of a Kubernetes installation for those organisations that don’t want to tie into a cloud provider. Interestingly, the reasons AWS put forward for why private clouds fail will be just as true for themselves: enterprises can’t manage elastic demand properly, whether it’s in their own data centre or when they’re paying someone else. Command and control financial governance structures just aren’t changing overnight to suit an agile provisioning model. (As an aside, if you want to transform IT in an enterprise, start with finance. If you can crack that, you’ve a chance to succeed with sec and controls functions. If you don’t know why it’s important to start with finance, you’ll definitely fail). But enterprises have other reasons not to go all in on AWS: lock-in (see above) and economies of scale. We’ve already referenced Dropbox’s move from AWS to their own DC’s. The zero-day cost of running Kubernetes is very high (red line on the left), but the value increases exponentially as you scale up the service. This is why AWS makes so much money: the value to you as the user is massively greater than the cost for as long as its non-linear nature isn’t revealed to you. Put bluntly: if you get big enough, then AWS starts screwing you, but you might not care, since your business is scaling. You’re a frog, boiling in the kettle. If and when you realise where you are, it’s too late – getting out is going to be very very hard. Linux only really got going when large companies got behind it. Similarly, Kubernetes has had significant funding from the start from two big players: Google and RedHat. What’s going to really move the needle is if organisations take seriously AWS’s monopoly problem. Some have to take it seriously, because there are regulatory requirements to have plans to move somehow within a reasonable timeframe should Bezos lose his mind, or Amazon becomes riddled with Russian spies. Other reasons are that different cloud providers have different strengths, and large orgs are more likely to straddle providers as time goes on. If enough organisations do that, then there’s little that AWS can do to counter the threat. With Microsoft there was no alternative but to pay their tax if you wanted the software, but with Linux you really aren’t truly locked in to one provider. I’ve seen large orgs play chicken with RedHat during negotiations and put serious money into investigating using CentOS instead. The same thing is happening with Kubernetes as happened with Linux. We’re already seeing Kubernetes adopt the ‘distro’ model of Linux, where a curated version of the platform is created as an easier to consume ‘flavour’. Early on there was RedHat’s OpenShift, which has since renamed itself ‘OKD‘ (OpenShift Kubernetes Distribution, I assume). Some orgs will pay the tax of having a large monopolistic supporter of Kubernetes run the show, but (as with Linux) there will always be the option of switching to in-house support, or another provider, because the core system isn’t owned by anyone. Kubernetes is big enough and independent enough to survive on its own. Look at OpenShift, and how it avoided accusations of being a Kubernetes fork. Whatever the legal arguments, RedHat’s protestations were not disingenuous – they know not only that money can be made on top of Open Source infrastructure, but that they benefit from its success too. They don’t need to fork Kubernetes. Interestingly, they did fork Docker, even before the OCI fork, and with good reason, as Docker were making decisions clearly designed for their own survival (hard-coded default registry being Docker’s own for reasons of ‘consistency’, for example). Kubernetes doesn’t have this problem. I’ve not heard of any vendor pushing their own interests over others at the cost of anyone else into the codebase. 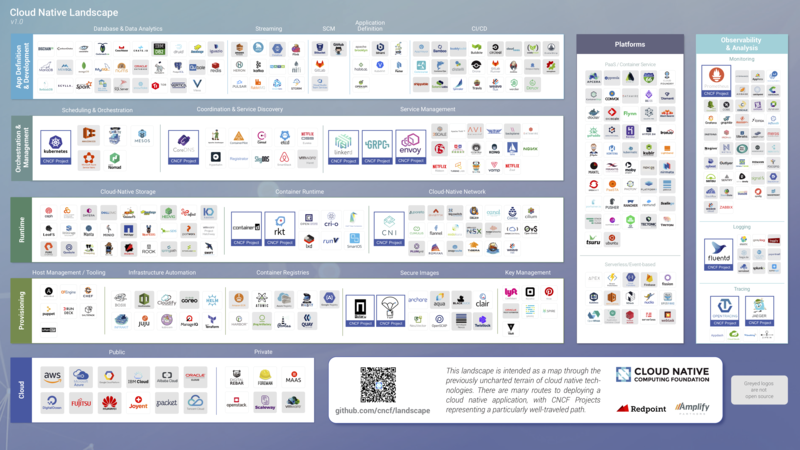 Cloud Native Computing Foundation ‘Landscape’: there will be a test…. Like Linux, there are a bewildering array of technologies sitting in ‘userland’ in various states of maturity and community acceptance, most of which likely will be out of date in a couple of years. I can barely remember what the various tools in logging do, let alone span the whole graph like an architect is supposed to. If I’m using AWS I’m looking at that, thinking: what a headache! You may as well try and get to the bottom of sound in Linux, or consider all the options when deciding on a Linux desktop (45!). My original thesis was that AWS is the new Windows to Kubernetes’ Linux. If that’s the case, the industry better hurry up with its distro management if it’s not going to go the way of OpenStack. Or to put it another way: where is the data centre’s Debian? Ubuntu? Interesting stuff. Regarding the CNCF landscape, certainly at QCon I got the impression that the community was coalescing around a much smaller set of technologies, and you can probably pick the most popular tech in each area and meet 99% of your requirements. Great post! Totally agree on AWS and their obvious reluctance towards Kubernetes. It is clearly a threat for cloud vendors who want to lock their customers instead of just providing good services and leave an option to leave on the table. You don’t leave a good provider – you leave a bad one. I didn’t saw it mentioned but Microsoft is a top backer and contributor of Kubernetes. AKS is a first citizen. Anyone have opinions on what Rancher has been doing? Rancher provides a way to roll out and manage K8s clusters from a web interface. We are also using it to avoid the IAM lock-in you mentioned by using it for proxy authentication to our directory via SAML. Whatever I can’t do in rancher, I can still do from kubectl/helm, etc, since it’s still running kubernetes. I also recently found out about https://k3s.io/ that they are working on as a lightweight kubernetes for edge/bare-metal install, also working on ARM. I haven’t tried it yet, but it seems like they’re working in the “Debian/Ubuntu” direction, anyway.